NELPG was formed in 1966 with the intention of preserving some of the steam locomotives still working in the North East of England. 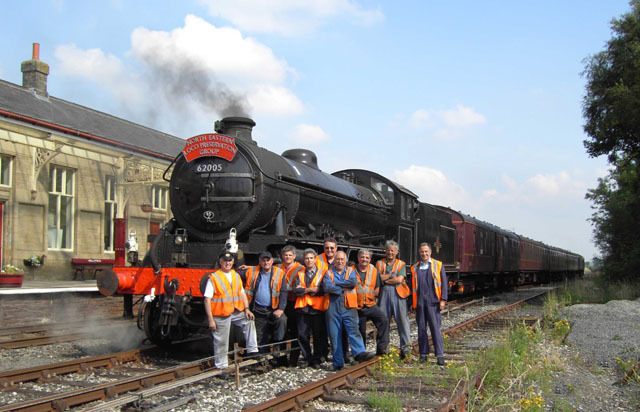 In less than 18 months this growing band of volunteers had raised sufficient funds to purchase two heavy freight locomotives. These were J27 0-6-0 65894 and Q6 0-8-0 63395. Both of these locomotives were subsequently overhauled and transferred to the North Yorkshire Moors Railway in the early 1970s. In 1972 the group had acquired another locomotives from the North East, which was mixed traffic K1 2-6-0 62005 – which was donated to NELPG. In 1979 NELPG was offered the Q7 0-8-0 63460 – another heavy freight locomotive – on long term loan by the National Railway Museum - and in 1983, purchased J72 0-6-0 tank engine 69023 'JOEM'. In the late 1987s the Group took charge of A2 Pacific 60532 'Blue Peter' also on long-term loan. What is remarkable about this collection of locomotives is the fact that they are all unique. In practice NELPG has charge of a sizeable part of the North East's Railway Heritage. But rather than keep the locomotives stuffed and mounted, NELPG's primary objective is to have as many of its locomotives in steam as possible. In fact all 6 locomotives have been returned to steam at one time or another with 62005 and 60532 seeing numerous trips on the main line. 65894, 63395 and 69023 have seen service on other preserved railways as well as on the North Yorkshire Moors Railway. NELPG is a charity run by volunteers. Members are a mixture of old and young who are skilled and unskilled enthusiasts. Some are retired whilst others seek a hobby totally different from their daily routine. Having such a hobby is the envy of many who see NELPG's locomotives operating either on the North Yorkshire Moors Railway or elsewhere in the country. There is nothing more pleasing than seeing the K1 blasting along the West Highland line or the J27 and Q6 powering their way up the steep gradients on the North Yorkshire Moors Railway and being able to say "I helped to make that possible". You could help us maintain these majestic sights and sounds by becoming a member. NELPG publishes its own bi-monthly newsletter 'NELPG NEWS' and has monthly evening meetings between September and May in the Darlington Club and Institute. For those who like to get their hands dirty there are working parties at Grosmont on the North Yorkshire Moors Railway, and at Hopetown Carriage Works, Darlington on Monday and Thursday evenings. Also there are opportunities for working members to become members of the main line support crews when 62005 works trains on Network Rail metals. We always need more hands to spread the load. So why not join us? Just fill in the membership form and return it to the Membership Secretary. You will be most welcome.